Lutherans look like people around the world--for indeed they are. They represent the world's largest Protestant group. The 58 million Lutherans can be found on every continent. They worship in hundreds of languages. In the United States, there are about 9 million Lutherans. They are African-American, Anglo, Asian, Hispanic, Indian. Lutherans build their lives on Jesus Christ. They believe Jesus Christ is the only, perfect, son of God. They believe that Jesus died for them and for every person in the world. And Lutherans believe that Jesus rose from the dead and lives for them-and for all people who believe in him as their Savior. Jesus brings people close to God. Lutherans believe their lives-today, tomorrow and in eternity-depend on Jesus. Lutherans live with a sure hope of eternal life because of Jesus Christ. They know they're not perfect, that they stumble and fall in their daily walk with God. But they also know that their forgiveness has been won and paid for by Jesus Christ and when they repent and seek forgiveness, God will forgive them because of Jesus. And, they want to tell others about that hope! The Bible is God's word, spoken through human writers. Everyone will have existence after death-either in heaven or hell- forever. God has a plan to end the world, when he will judge everyone-both living and dead. Lutherans proudly display the sign of the cross, a symbol used by all Christians. The cross symbolizes the terrible death that Jesus suffered as punishment for their sins. Lutherans prefer a cross that is empty-with no body on it-because the empty cross is a symbol of Jesus' victory over sin and death. Lutherans take their name from Martin Luther. He was a German priest who broke away from the Roman Catholic Church in the early 1500s. Luther's writing and teaching sparked the Protestant Reformation. Through his study of the Bible, Luther helped the Christian Church rediscover the truth that God is loving and that he offers forgiveness and eternal life as a free gift because of Jesus Christ. Luther taught that people-no matter how hard they try-cannot earn God's forgiveness or a place in heaven. It is a gift that people receive through faith in Jesus Christ. Grace alone-God loved the world, though we do not deserve his love. He sent his Son to love the unlovely and save the ungodly. Faith alone---Jesus has provided for our forgiveness and life; those who hear this promise and believe it, have what it offers. People don't "get" faith; God gives it as he gives us his promises. Scripture alone-The Bible is the only source that shows God's will and the only basis for faith. Lutherans talk about Law and Gospel. The Bible gives the Law, showing God's expectation of people and the terrible consequences for not following his commands. But the Bible also reveals the Gospel-the "good news" of God's love and forgiveness. They view Baptism and the Lord's Supper as the means by which God gives people his grace. Local churches, or congregations, are the central community for faith and practice. Congregations choose a trained person to be their pastor. Christian education is important. 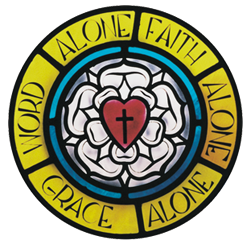 Lutherans provide Sunday schools, Bible classes, home-study groups, preschools, elementary and high schools, and colleges. They share their faith with individuals. Collectively, they sponsor mission programs worldwide. They care about people in need- providing hospitals, help for children and families, and worldwide relief for the hungry, homeless, and helpless. Their worship style, which includes a lot of music and singing, is often "liturgical,' following the worship form handed down from the early Christian church. It is often expressed in contemporary forms. The people who belong to the local congregations of The Lutheran Church-Missouri Synod are people of the Bible. The Bible is our Sacred Scriptures, the Word of God. We treasure God's Word because it teaches us about eternal life through Jesus Christ. The Word is Gospel ('good news") because it assures us of God's love and faithfulness. It inspires us to tell others. It moves us to help people in need. As members of some 6,100 congregations, we count 2.6 million baptized members in The Lutheran Church-Missouri Synod. We emphasize the local congregation. That's where people are touched one-to-one. That is where the Word is taught, where our sacraments of Baptism and the Lord's Supper sustain our life with God. Our Synod--our national organization--serves in support of and on behalf of its local member congregations. Support includes Sunday school lessons, hymn books, resources for ministry, and worship material. Local churches receive help for special areas of ministry to serve people in both the congregation and the community. As a Synod we combine our strengths and resources to do things that individual congregations can't do. We send missionaries to other countries, maintain colleges and seminaries, provide loan funds for building churches, and operate a health and retirement system for full- time church workers. The word synod comes from two Greek words: syn, meaning "a meeting or assembly," and hodos, meaning a ``way or journey." We describe ourselves as congregations "walking together," because our congregations all confess and practice the same teachings of God's Word. The Synod was formed in 1847 by 16 congregations, representing German Lutheran settlements in several U.S. locations. It was first known as the German Evangelical Lutheran Synod of Missouri, Ohio, and Other States. While our forefathers were German, today we count members with ancestry from every continent, including North America. Yes, the national office is in Missouri-in Kirkwood, part of the St. Louis metropolitan area. Together we coordinate missionaries in 43 other countries and connect with 19 partner churches worldwide. We provide food and medicines where there is famine, and we give support and instruction so other people can become self-sufficient. Because God's Word tells us that he knew us even before we were conceived, Missouri Synod Lutherans care for human life. That is why we oppose abortion, yet offer love and forgiveness to those who have been affected and help when we can. Our care for human life moves us to give from our personal resources to support hospitals, nursing homes, adoption services, and helping programs for individuals and families. Our Missouri Synod congregations operate the largest Protestant school system in the United States. We have 1,000 preschools and day-care centers, 998 elementary schools, and 64 high schools. Our 10 colleges prepare professional church workers and offer Christian training for Christian laity. Two seminaries provide education beyond the bachelor level to prepare pastors for our congregations. Because God's Word is so important, we emphasize Christian nurture: Our congregations offer Sunday school for children, youth, and adults. We hold other Bible study classes and small-group ministries to help people of all ages learn and apply the Word in their daily lives. Every organization, every people, must have a base on which to stand. For us in the Missouri Synod it is God's Word, the Bible, which is without error or contradiction. In the 16th century, Martin Luther, a German monk, made his stand on the Word, stripping away human traditions and requirements that had drawn attention away from God's truth. Our beliefs on what the Scriptures teach are explained in the Lutheran confessional writings in the Book of Concord. From the Word, we know that there is one God, but that he has three persons-Father, Son, and Holy Spirit. They are of the same essence-equal in power, in eternity, and in majesty. We believe the Father created and sustains the world. The Scriptures tell us that human beings chose to follow their own way and fell into sin-direct disobedience to God. We believe that Jesus Christ, true God and true man, suffered and died on earth as punishment for sin. He lived in perfect obedience to God. He was without sin. It is only because of him-not because of anything we can do-that our perfect relationship with God is restored through the forgiveness of sin. Then God counts the righteous life of Jesus as if we lived it. We believe that the Spirit inspired the writers of the Bible and through it inspires faith in us. Through the Word and the Sacraments-Holy Baptism and the Lord's Supper-he also keeps us in faith. Three principles undergird our beliefs: Scripture, faith, and grace. The Scripture is the only source of knowledge about God and his will for us. Grace tells us that as human beings we cannot earn God's love, forgiveness, or everlasting life. It is all a gift of his love. Only by faith in Jesus Christ do we receive forgiveness. Through faith in him we come into a relationship of peace with God. As people of the Word, we Missouri Synod Lutherans, while we often speak of "the cross," focus more on the resurrection of Jesus. Jesus died on the cross-but he rose from the dead to assure us that God accepted his sacrifice. He lives and we too will live with him forever. And that is reason for celebration! www.lcms.org The LCMS web site allows access to hundreds of pages of Synodical information. 1-888-LCMSFA The FaxBack service faxes LCMS documents, forms and program information directly to your fax machine, 24 hours a day, seven days a week.